We are happy to pass our love for Bloedbessen on to you. That's why we enjoy telling you how you – just like us – can get the most enjoyment out of our product. Our Bloedbessen are fresh, juicy and full of flavour. But there’s more to what makes them so popular: they are chock-full of fibre, vitamins and other antioxidants, making them extraordinarily healthy. Antioxidants are important in eliminating undesirable microorganisms and neutralising free radicals. The high concentration of antioxidants in Bloedbessen makes an important contribution to a healthy eating pattern. We hope that you treat our Bloedbessen with as much care as we do. To help you get the best out of the red currants, we’d like to give you some practical storage tips that will keep them in top condition. Bloedbessen do best at a temperature of 2 to 4 degrees Celsius. You can best keep them in the original packaging and only wash them just as you’re about to enjoy them. A splash of water is all that’s needed to make the red currants gleam like mirrors! ‘Where can we buy them?’ we hear you say. Bloedbessen are mainly available from the better fruit and vegetable shops, but also from specialists at the better markets. Can’t find them anywhere? Refer your speciality shop or market specialist to this website. With any luck, we will be able to arrange for Bloedbessen to be available near you soon. Quality first! That’s why we pack our Bloedbessen ourselves, to ensure that you always get the right quality. We offer our Bloedbessen in two ways: in an open package and a closed package. 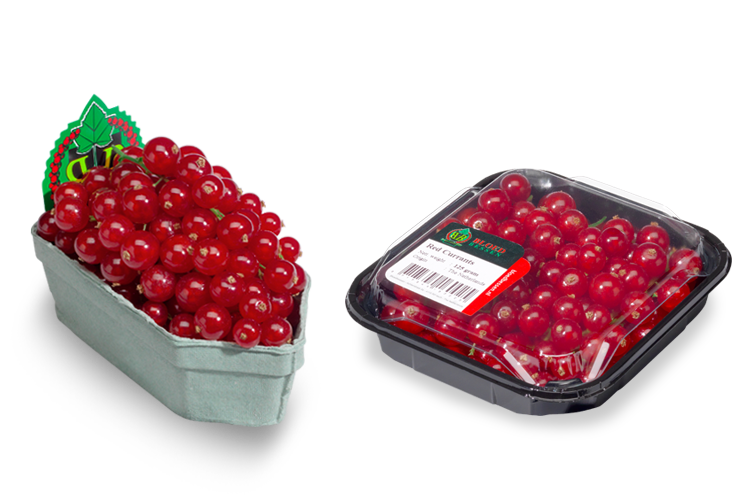 These punnets (170 and 125 g) and trays (125 g) both meet the highest quality standards for food safety and hygiene.